Looking at some of the biggest movies of this year, it’s easy to see how this plays out in our perception. Avengers, Deadpool and the recently released Hans Solo movie all feature strong hero figures, and we are more than happy to buy into the stories. They’re super-entertaining and the heroes are mesmerising! Movies are big business – superhero movies in particular. Movie directors and actors come together to create a mythology that perfectly aligns with the heroic characters. This is what makes them the iconic figures we want to emulate… and why not? Life is full of inspiration. We look to each other for guidance in everyday situations, so why not look to movie heroes too? They might just inspire us to be the greatest possible versions of ourselves. The mass marketing is also an incredibly clever part of this movie making alchemy. All aspects come together to create an alchemical reaction in us. It results in a desire to not only to watch the movies, but also to be like our heroes in whichever ways we can. Pre-movie marketing includes backstories, humour, interviews, previews, trailers; all manner of things that make up pop culture lore. Another ingredient that keeps the media machine rolling is the whole range of action figures, toy accessories and merchandise that support these movies. This keeps the dream alive long after people have left the cinema, and obviously kids relish the opportunity to make believe with these figurines. The huge numbers of ancillary sales is further evidence that making great movies goes way beyond the box office. Movie heroes normally have distinctive costumes that are instantly recognisable, which makes them natural choices for dressing up. This is the same for both children and adults. Movie heroes appeal to all age groups, so there’s no reason why dressing up like our favourite heroes should be more fun for children than it is for adults! 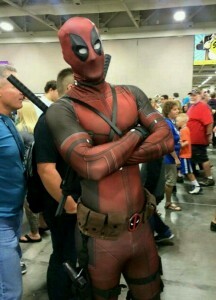 This is proven by the massive popularity of fandom expos like Comic Con and Supanova where Movie Icon Cosplay abounds. At these events, people come from miles around to take part in a kind of alternate reality for a weekend. 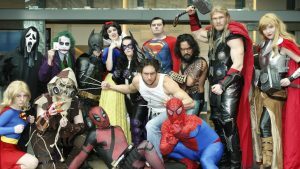 Adults of all ages come together (often with kids in tow) to dress up as their favourite movie heroes and video game characters. Cosplay is a big thing here, taking dressing up to the next level. Why is Captain America such a popular movie hero? This Avenger is so easy to relate to. A dose of “Super-Soldier serum” turns Steve Rogers, a rejected military soldier, into Captain America. He faces plenty of challenges on his mission to take down a warmonger and a terrorist organization. This 6ft2 superhero represented the pinnacle of human physical perfection, after being augmented to superhuman levels. He’s as smart as he is agile, as quick as he is resilient, and strong as an ox. It’s not hard to see the appeal! 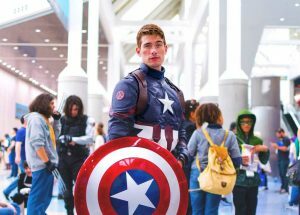 Dressing up as Captain America is bound to make you feel great! Marvel hero Thor is the king of Asgard, and a founder of the Avengers. His irresponsible behaviour creates a conflict between Asgard and Jotunheim, resulting in him being exiled to Earth, and stripped of his power and king status. He later redeemed himself after learning humility, finding love and saving his friends from his brother Loki’s genocidal schemes. Thor is a popular hero for having overcome arrogance and growing from his mistakes. Those who understand the concept of sacrifice and love the idea of rising like a phoenix from the ashes can’t help but love Thor. He later enlisted the help of mutant allies Negasonic Teenage Warhead and Colossus to hunt down and repay the evil scientist. People who like the idea of becoming an avenger with a wicked sense of humour and a dedication to justice will love dressing up as Deadpool. 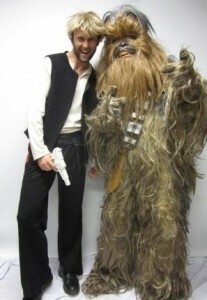 If you dress up as Hans Solo, you’ll be emulating the superstar captain of the Millennium Falcon – one of the formidable leaders of the Rebel Alliance. What’s more… who wouldn’t want Chewbacca for a best mate? There’s no doubt about it – movie icon cosplay heroes are here to stay. They are just one of life’s many inspirations and they drive the demand for cosplay and costume parties all over the world. When it comes to movie heroes, if you can’t beat them, join them… or become them!